Budgets are the central political document that activates government policy by raising revenues and allocating expenditures legislated by the Parliament. The process of taxing and spending distributes benefits and burdens across the community. So, as the OECD has said, the budget is the ‘single most important policy document of governments, where policy objectives are reconciled and implemented in concrete terms’. Officials developing budgets often assume that taxing and spending decisions will be gender neutral, unless it is a matter of a designated ‘women’s program’. This overlooks the different roles played by men and women in the social division of labour, both paid and unpaid, which result in purportedly neutral policies having quite disparate effects. The lack of attention paid to the disparate effects of budgetary decisions on men and women means that such decisions fail to address gender inequality and may all too often have the inadvertent effect of widening rather than narrowing gender gaps. For example, ‘austerity budgets’will usually have a disproportionate impact on women. Women’s well-being is more reliant on public spending to provide health and services, employment and household income support. In general, because their investment of time in the care of children reduces their capacity to earn market income, women are more reliant than men on redistribution through tax and public expenditure systems. They are also more likely to be employed in the human services provided by government. Thus, fiscal constraint and tax reductions may impact women more than men, both as consumers and as providers of government-funded services. Budgeting principles tend to assume that expenditure on large-scale physical investment, on ‘capital’ account, is suitable for long-term government borrowing and public equity in ‘public-private partnerships’. Public expenditures supporting human capital are not analysed in budget settings as comparable long-term investments. Rather, expenditure budgeted on ‘current’ account – including on human (capital) services such as health, education and childcare - is usually supposed to be financed by current taxes. Such government programs, which pay the salaries of health workers, teachers and early childhood educators are highly visible and vulnerable to policies of fiscal restraint and expenditure cuts in the short term. The way budgets are framed has also failed to include the non-market reproductive and care work on which the market economy rests and is blind to the potential effects of increased labour market participation on the provision of household and family care work. Increased female labour force participation that is not offset by the redistribution of household work increases time stresses on women more than on men, reducing their leisure time, health and well-being. Budget framing has obscured rather than illuminating the economic contribution of household and family work; the gendered allocation of caring roles in the market and household economy; and the differential effects of policy on women and men in market and household sectors. Moreover, it has often been based on assumptions of the pooling of household resources, an assumption that empirical research was to bring into question by the 1980s. Feminist interventions in relation to the budget process have been characterised by a particularly close relationship between feminist researchers and policy practitioners, with a number combining both roles. For example, Marilyn Waring was so incensed by her experience chairing the public accounts committee of the New Zealand parliament that she undertook ground-breaking research into the distorting effects of the United Nations System of National Accounts on the presentation of national accounts. In 1988 she published What Men Value and What Women are Worth,revealing the failure of national accounts or the measurement of gross domestic product (GDP) to count either environmental values or the value of women’s unpaid work in the household economy. By the early 1990s, feminist critiques were leading to the inclusion of some non-market production, such as subsistence agriculture, in key measures of the economy such as GDP. By 2009, there was acknowledgement by some leading economists that, for example, the omission from GDP of the value of women’s work in providing breastfeeding and breastmilk had important implications for public policy and child and maternal health. Work by feminists such as Diane Elson and Susan Himmelweit was instrumental in illustrating that the invisibility of women’s economic contributions distorted public policy priorities and budget decision-making, making it less efficient and less equitable. In Australia, applied work by economists like Rhonda Sharp contributed to the development of the theory and practice of what became known internationally as gender budgeting or gender-responsive budgeting. Both feminist policy makers and social science researchers understood that implementation of gender equality policy required engagement with the central political and policy process of budgeting. Only a minuscule portion of budgets were allocated to designated ‘women’s equality’ programs. It was more important to ensure gender assessment of the much larger budget allocations long assumed to be gender neutral. Feminists in government (often referred to as femocrats) and feminist economists argued that gender-disaggregated impact analysis was required, drawing on evidence of the distribution of men and women across different sectors of the paid and unpaid economies. This did not mean a separate budget for women, but close gender analysis of the likely impact of budgetary decisions. Taking into account both market work and non-market work was essential for an accurate assessment of likely impact and avoidance of unintended consequences. Such assessment might reveal and hopefully pre-empt the results of apparently neutral government policies, or the interaction of these policies, in increasing gender inequality. Policy failures or unintended consequences frequently follow when policy is made assuming gender neutrality, without taking account of differently situated men and women. Hence there are important efficiency as well as equity arguments to be made for gender budgeting. 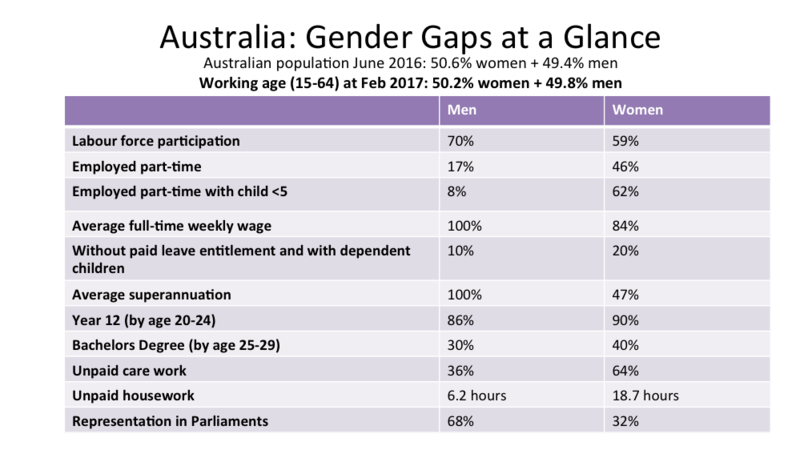 Other important gender gaps, such as in access to leisure, are now more difficult to track because the Australian Time Use Survey has been abandoned. But the patterns of work and care identified by Baird need to be taken into account in policymaking if women are not to disproportionately suffer poverty in old age. Women’s disproportionate contribution to unpaid care work and housework contributes to significant economic disadvantage and dependency. In Australia, the gap in rewards for women’s economic contribution is reinforced and perpetuated by the wage-based superannuation savings system for retirement introduced in 1992. This market-based rather than citizenship-based system of retirement income support significantly disadvantages women – given that women are more likely to have breaks in paid employment and to return to paid employment on a part-time basis, often in lower paid jobs. The Australian federal government introduced the world’s first women’s budget statement in 1984 and continued to produce detailed budget statements until 1993. Thanks to policy transfer through regular meetings of State and Commonwealth Women’s Advisers, gender budgeting was introduced in all Australian jurisdictions in the 1980s and early 1990s. As seen below, the theory and practice of gender budgeting was then exported internationally through intergovernmental bodies such as the Organisation for Economic Cooperation and Development (OECD) and the Commonwealth of Nations. At the 1996 meeting of Commonwealth Ministers Responsible for Women’s Affairs, the ministers called on Commonwealth countries to pilot gender budgeting – a call endorsed by the Commonwealth Finance Ministers meeting. Although Australian femocrats initiated the world’s first gender budgets, non-government women’s organisations have often played a critical role in carrying out and lobbying for gender impact analysis of budgets. In South Africa, collaboration between non-government organisations and women parliamentarians was crucial to the development of South Africa’s pioneering Women’s Budget Initiative. In the United Kingdom the Women’s Budget Group has been active since 1989 and there is a separate Scottish Women’s Budget Group promoting gender analysis in Scottish budget processes. Civil society groups have also played an important role in Japan and South Korea. In Australia, as Commonwealth and State governments exited from gender budgeting, non-government organisations also needed to fill the gap. Since 2014 the National Foundation for Australian Women has published an annual Gender Lens on the Budget, prepared on a voluntary basis by policy experts. While this external perspective is valuable external groups cannot do the same work as an internal budgeting process that takes account of gender in setting policy and expenditure priorities, indicators and goals. Gender budgeting may be done at the level of principles or conceptual analysis or may be delivered through identification of key indicators of taxing and expenditure directed to gender equality programs and outcomes. More substantially, it may involve detailed modelling of the distributional impact of taxes and spending on women and men, including incidence analysis for indirect taxes such as the company tax or value added taxes. This can be a complex task. To achieve gender budgeting requires adequate data, including gender-disaggregated and intersectional data, about a range of government policies and effects. A gender budgeting movement gained momentum during the 1990s underpinned by the work of feminist economists and the emerging epistemic community embodied in the International Association for Feminist Economics (IAFFE). Of those economists most closely associated with gender critique of macroeconomics and the development of gender budgeting, Rhonda Sharp, Nancy Folbre and Sue Himmelweit were all to have terms as President of IAFFE. Another feminist economist, Diane Elson, who was a key actor in the UK Women’s Budget Group, developed the conceptual framework used in the Commonwealth of Nations pilot gender budgeting program. Operational guidelines were provided by feminist economist Rhonda Sharp, who had experience developing the initial South Australian women’s budget, and Debbie Budlender, a researcher for a South African non-government organisation and a founding member of the South African Women’s Budget Initiative. Full and effective implementation of the Platform for Action … will require the integration of a gender perspective in budgetary decisions on policies and programmes, as well as the adequate financing of specific programmes for securing equality between men and women. Today, gender budgeting is receiving renewed attention both in developed and developing countries and is being promoted by intergovernmental institutions like the United Nations, the Commonwealth of Nations and the Inter-Parliamentary Union as well the OECD and the International Monetary Fund (IMF). International non-government organisations such as Oxfam are also promoting best practice in the area. In a global development context, gender budgeting is seen as one part of the process in achieving the UN Sustainable Development Goals. At a regional level, the European Union and the Council of Europe have embraced gender budgeting and the combination of analytic and normative functions it can perform – both incorporating a gender perspective at all levels of the budgetary process and restructuring revenues and expenditures in order to promote gender equality. By 2014 over 90 countries had experimented with some form of gender budgeting as part of gender mainstreaming. More recently, the OECD has reported that not only are its member states practising gender budgeting but some have also introduced statutory provision for it in their budget law (Austria, Iceland, South Korea, Mexico, Netherlands and Spain). In other cases, including Belgium and some of the Nordic countries, there is no statutory provision for gender budgeting (as contrasted with broader gender equality principles) but the budget authority provides guidelines for implementation. In 2017 the Canadian federal government included a gender statement in its core budget documentation for the first time (Government of Canada, 2017), described as a first comprehensive attempt at reviewing and reporting on how budgetary decisions affect women and men differently’. It detailed not only gender gaps but also the intersecting identity factors (GBA+) that must be considered in public policy – for example, ethnicity, age, income, sexual orientation. Gender innovation in applied work by feminist economists has resulted in a global movement for gender budgeting. A gender budget analysis can identify the different impacts on women and men of budget policies that are formally neutral, such as tax, welfare and retirement policies. A gender equity policy would then seek to correct unfair impacts. For example, policy aimed at increasing women’s workforce participation and private retirement saving must take account of any adverse impacts on unpaid reproductive and care work. This is essential if government policy is to achieve its stated policy goals. Gender budgeting is not a panacea for inequality. However, gender budgeting is a key government and civil society process that can contribute to gender equal policy development and help hold governments accountable for achieving gender equality goals. Waring, Marilyn (1988; 1999) Counting for Nothing: What Men Value and What Women are Worth, Wellington: Allen & Unwin; 2nd edn, Toronto: University of Toronto Press. Our thanks to Rhonda Sharp and Julie Smith for their contribution to this case study.